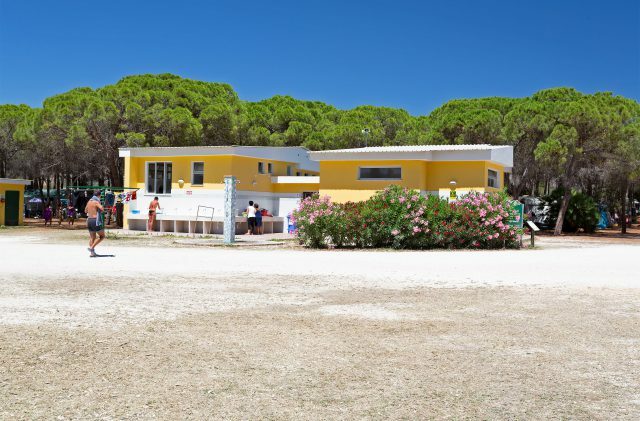 At Camping Cala Ginepro, we have four sanitary blocks located in different areas of the campsite, easily reachable from each accommodation unit; every complex includes separate areas for personal hygiene, the washing of linen and the washing of dishes. The toilet area, with separate ladies and gents entrances, is equipped with free cold and hot showers, as well as toilet cubicles with toilet paper, sinks with shelves, mirrors, coat hooks and soap. The use of hot showers is governed by a timer with a limited time cycle – this is to ensure that when water is not required it can be turned off (or on) from within the shower using the appropriate button. Water is a precious, limited resource, to be used in an eco-aware fashion! If one cycle is not sufficient for your needs, you can reactive another cycle. At Camping Cala Ginepro, we always go out of our way to make it easy for families with children: for this reason, the female toilets are equipped with a changing table and a bathtub with shower, to ensure there is no compromise on comfort even in the communal spaces. The toilets are cleaned and sanitised multiple times a day, and even during the night. At Camping Cala Ginepro, two of the sanitary blocks feature toilets without barriers, which are suitable for guests with disabilities. In this regard, please contact us so that we can give you specific advice on which accommodation to select to be closer to the most appropriate complexes for your requirements. The toilets without barriers are located close to the bungalows and the meeting point. Laundry rooms for stress-free washes! In every cleaning complex, you will see signs for the laundry rooms for hand-washing. There are communal washing lines adjacent to them. Moreover, in the sanitary block behind the amphitheatre, close to the exit leading to the Cala Ginepro reef, you will find professional washing machines and tumble dryers. The washing machines are pre-loaded with detergent. Tokens, available from Reception, are required to use the machines. Each complex contains a dedicated area for washing dishes. To clean pans and dishes perfectly, there is a hot-water dispenser. Next to the dish-washing area, you will find separate sinks for the cleaning of fish.